There is no shortage of data today. In fact, the organizations who best manage their data, perform better. IBM dashDB allows you to empower the analysts in the organization who need to load, cleanse and manage datasets – on a secured, scalable platform – and do it quickly, without yet another burden on IT. And let’s be honest, the days of emailing files, network shares and even “somewhere on Linda’s laptop” are short-lived in this age of information. Locus Solutions has helped customers successfully deploy to the cloud – and we can help you be successful too. We will begin with a no-obligation assessment to review the features of IBM dashDB that matter most to you and develop a business value assessment to understand the time and resource savings the cloud may provide you. 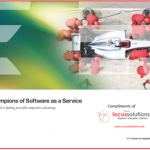 To make getting-started easier for you, download the “Champions of Software as a Service – How SaaS is fueling powerful competitive advantage” report – compliments of Locus Solutions.